7 years on, Bitcoin still remains the largest cryptocurrency by market capitalisation (market cap). While Bitcoin may have been the most volatile currency, it has since ceded that mantal to up and coming altcoins. The transformation of Bitcoin from a volatile experiment, to a “stable” form of electronic money is illustrated in Figure 1. Figure 1 plots the 90 day moving average market cap of Bitcoin against its 90 day realised volatility. 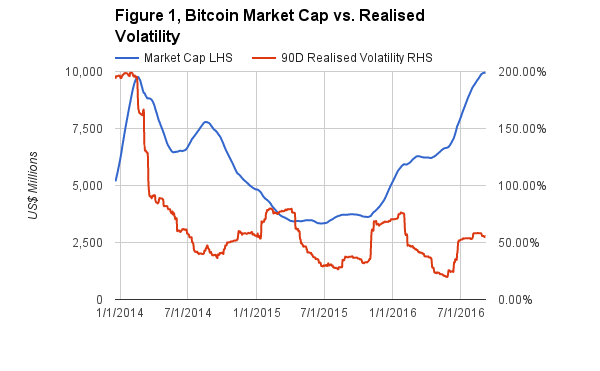 Volatility peaked alongside the market cap during the 2013 bubble. Over the past 3 years, the market cap fell substantially then surpassed the 2013 high earlier this year. During the same period, volatility fell and continued falling. The solution to a boring coin is more leverage. Given the increasing liquidity, leverage offered by platforms like BitMEX and our competitors will increase to retain the attention of speculators. If the volatility keeps falling, 500x and 1,000x leveraged trading will become increasingly popular. Regardless of the form, increased leveraged trading via derivatives bleeds into the spot market. Market makers must buy or sell the underlying asset to remain hedged and earn the Bid / Ask spread. Increased spot trading volumes help commercial users of Bitcoin reduce their transactions costs. More commercial users, means greater adoption, and hopefully a higher price. Ether, the token that rides on the Ethereum blockchain, was a boring altcoin until early 2016. The price spiked over 1,000% in a few months. 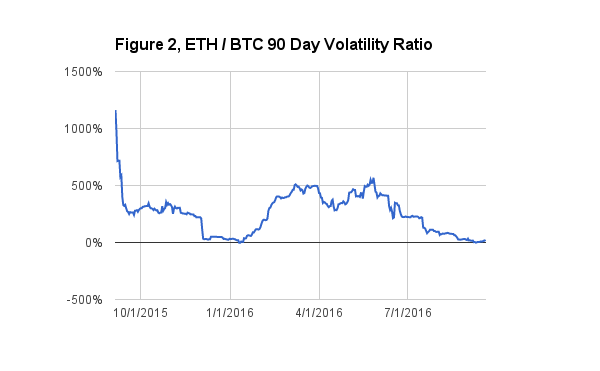 Figure 2 is the ratio between Ether and Bitcoin’s realised 90 day volatility. The ridiculous volatility drove on-exchange trading volumes over that of Bitcoin for a short time. Ether’s market cap surged to a high of US$1 billion in the Spring of this year. The smaller market cap means that it is easier to push the price around. Large whales can cause significant price volatility using relatively little capital. Many think this is counterproductive to a successful currency. But without greedy and impatient speculators, where will the liquidity come from? Monero’s impressive rise from obscurity has captivated traders over the past month. 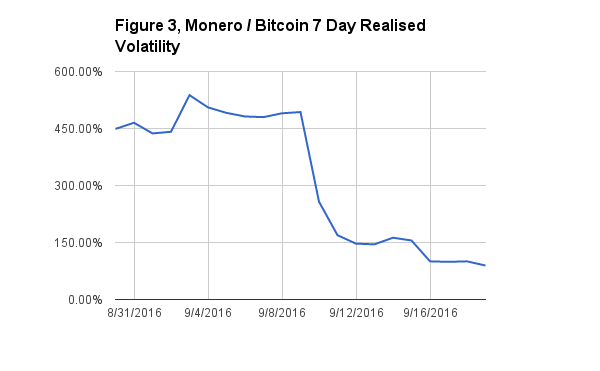 Figure 3 is the 7 day realised volatility of Monero. At times, Monero has become the most traded product on BitMEX. Traders are flocking to the Monero futures contract, XMR7D, because the price can move by percentage points within a few minutes. With 10x leverage, you can double your stack quite quickly. It is telling that the most liquid pair for any altcoin, is its exchange rate vs. Bitcoin. At the end of the day speculators want their profit denominated in the world’s most “stable” cryptocurrency.